Thank you for your interest in the City of Spirit Lake, Iowa. Here you’ll find news releases, background about the City of Spirit Lake and media contact information. 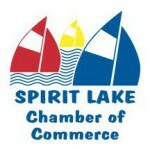 We’ve also included some photos of the city and a logo for your use in covering events or news from the City of Spirit Lake. at 712.336.1871 ext 13 or email gregg.owens@cityofspiritlake.org. Please remember to check our News and Events section often for information about important happenings in Spirit Lake and the surrounding area.